If you are a camera enthusiast, surely you have heard about the pre-orders that Amazon is currently offering concerning Canon cameras? The two “culprits” in question here are the Canon 40D and Canon 1Ds Mark III SLR cameras. 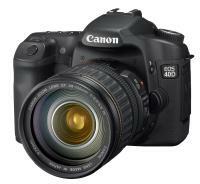 The EOS 40D is the lower end version of the two, bringing 10.1 megapixels to the table along with a 3″ LCD display, the famous DIGIC III image processor, 6.5 frame-per-second (fps) continuous shooting capability, sRAW mode, 35-zone metering system and integrated Self-Cleaning Sensor Unit. Shipping date has been slated for September 20th, although you will have to fork out $1,299.99 for one currently. Mind you, that price is just for the body and does not include any lens of sorts. For those who want to pick it up along with a EF 28-135mm f/3.5-5.6 IS USM Standard Zoom Lens, it will cost an additional $200. As for the Canon 1Ds Mark III, this digital camera features the same 3″ LCD display, but it brings a massive improvement in the megapixel count at 21.1 megapixels, complete with Live View and seven brightness settings for the LCD display, 5 fps at shutter speeds 1/500 second or faster, sRAW mode, 35-zone metering system, 45-point AF and integrated Self-Cleaning Sensor Unit. Shipping begins on September 10th and happens only after you pony up a car – one that’s worth $7,999.99 or more anyway. As you can tell by the huge price gulf between them, the EOS 40D will cater towards those who who are amateur photographers as well as budding professionals, while the (much more) expensive Canon 1Ds Mark III targets old hands at photography who want the best possible image with each shot. One thing’s for sure – neither would be an impulse purchase of any sort.